You are here: Home / Marketing Talk / Are you introducing the members of your band? Are you introducing the members of your band? For some reason, one of my most favorite moments at a concert is when the lead singer introduces the rest of the band. “So and so on bass guitar!” Then the bass player does a nice little solo. 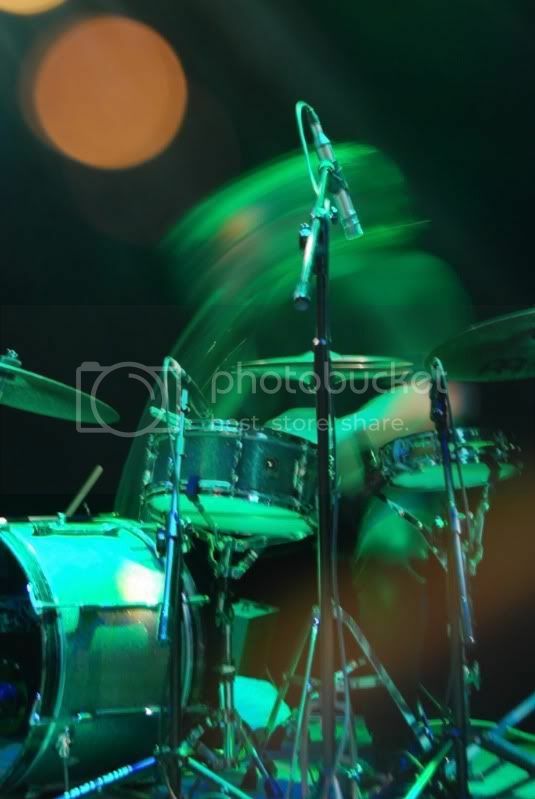 “So and so on drums!” And you get a hugely explosive drum solo. Why is that moment so thrilling? Maybe it’s because I enjoy hearing actual names for those guys and gals playing in the darkness behind the big rock star. Maybe it’s because I really like just hearing that one instrument all by itself. Maybe it’s because it shows that everyone in the band appreciates each other. Whatever the reason for my adoration, the introduction of the band has been on my mind lately. I think it’s a tradition that folks in the world of Social Media could find quite useful when building engagement with others. In every person’s case on Social Media sites, you are the show. You are the front person. But if you are trying to build your engagement online, or really if you’re trying to do just about anything online, you know that you can’t do all of this stuff by yourself. We all know this to be true. How can you perform this act in the online world? So, if you yourself are the show in the online world, how can you introduce the members of your “band” and let them have their snazzy solo in the spotlight? Well, there’s one key question you need to think about first. Do your bandmates know that they’re in your band? So, identify your bandmates and determine what kind of music you’re making. Then what? Here are some ideas. • Shine the spotlight on that person’s expertise: You can’t introduce someone as the bass player or the keyboardist online, but you can say, “If you’re looking for Facebook advice, please make sure you contact Tommy Walker.” You can say, “If you’re a small business, make sure you talk to Suzanne Vara and Joe Sorge (of Kitchen Table Companies).” Find out what specialties the people around you have and make sure other people know about those areas of expertise. • Sing that person’s praises: When you’re at a concert, you don’t see the lead singer jump up and down and clap wildly after each solo. The solo itself is both a chance to shine and proof of the singer’s appreciation. In the online world, however, clapping wildly and jumping up and down (er, virtually) is an excellent way to shine the light on the members of your band. Don’t just congratulate someone on their victories but let everyone know how great that person is doing. • Offer your bloggy real estate: The opportunity to “solo” is most comparable to letting someone guest post on your blog. It’s literally like you are stepping away and saying, “And here’s our guitar player…” That person can talk to your audience directly, showcase their personality and their specialties, and shine in the place where you normally shine. The fact that you’re letting them post on your site shows how much you respect them. • Introduce like instrumentalists to each other: Finally, you can quite literally introduce members of your band to other people who could be in the same kind of role in your band. Few things give me more pleasure online then finding two people who may have similar interests or objectives and introducing them. For example, whenever I see someone who loves gardening, I introduce them to Susan Fox. When I see someone talking start-ups or entrepreneurship, I introduce them to Carol Roth. And when someone is talking leadership, I enjoy introducing them to Lisa Petrilli. Let’s face it – while guitarists may enjoy jamming with the singer and the drummer, they REALLY enjoy jamming with other guitarists who have different styles and techniques to share. So what do you think? Are you introducing the members of your band? Do you have your band together? Do your bandmates know that they’re in your band? This is post #46 in The Engagement Series. If you’re worried about missing a post, please feel free to hit that little ole subscribe button over yonder. Very interesting thoughts Margie. I did a post a week or so ago thanking some people who inspire me. I don’t know that I have a “band” however, I do like to let others know that I respect and admire them. I think public acknowledgment of what makes other people valuable to you is just as important as comments and retweets. Love it! What a great way to introduce your band members at the same time as giving some advice. Wonderful post, Margie. Blogs that tie good advice to analogies are so much more fun to read. Thanks for the good post, Kriss. We’re planning a virtual open house next month to introduce our band…and our brand. I’m moderating the panel for the event and will definitely give each panelist a chance to do a riff to start things off. I agree with Daria – showing rather than simply telling was great. I’m glad to see that I score fairly well on these four suggestions, but there’s ALWAYS room for improvement.